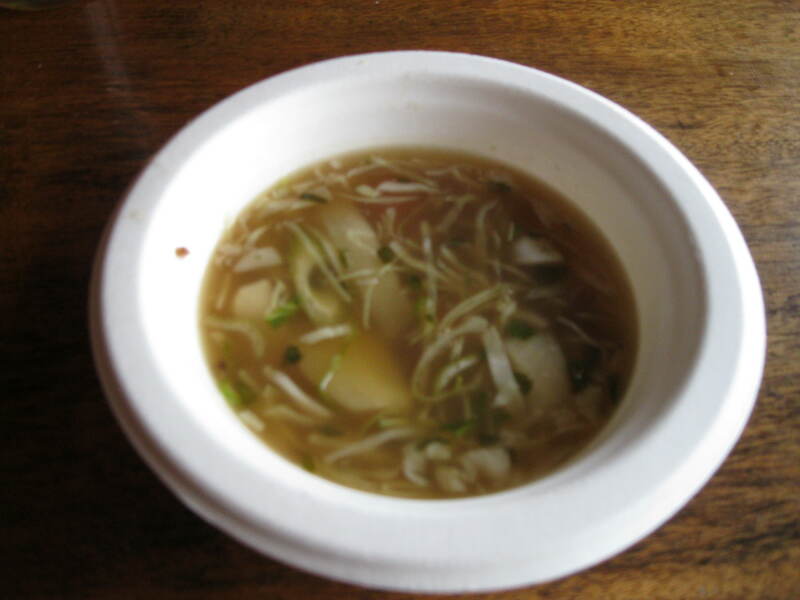 Soup and Bread | A blog about soup. And bread. 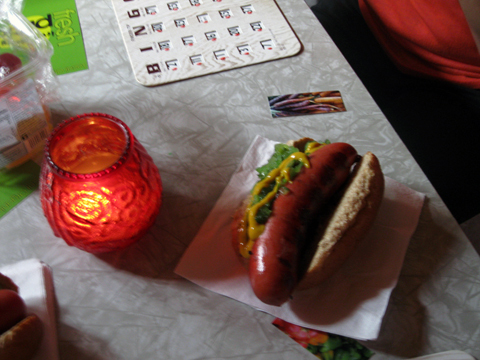 Veggie Bingo is back at the Hideout! We start up tonight (7/11) at 5:30 — so come on out! 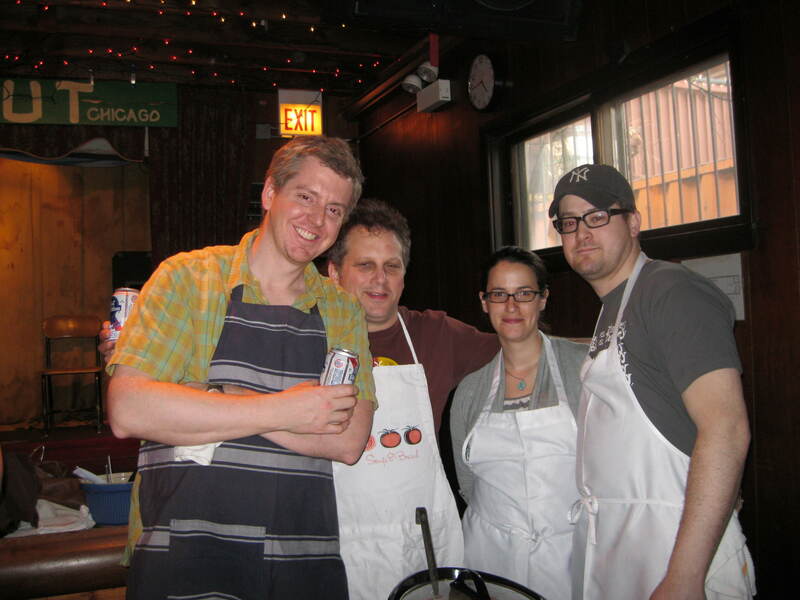 We’ll be calling games and grilling dogs at the Hideout to support Chicago’s community gardens. Co-sponsored by NeighborSpace, Hideout Veggie Bingo features a grand prize of fresh produce from Irv and Shelly’s Fresh Picks and a cornucopia of other prizes drawn from local artisanal food producers, farmers, and gardeners – plus FREE HOT DOGS donated by Hot Doug’s. Bingo cards are $2 each, or 3 for $5; all proceeds benefit local gardens. Our callers July 11 are photographer Jim Newberry and recording engineer Stan Wood; stay tuned as we announce additional celebrity guests. Kids welcome as long as they’re with a responsible grownup. So our whole crazy Potluck Wednesday idea started off with the biggest potluck of them all — our massive blowout to support the Garfield Park Conservatory on July 6. And then July 13 we had a spelling bee. And then THIS week, we had Eleanor Friedberger. And if those three don’t make a total potluck, I don’t know what does. So! We’re carrying on this new tradition of extreme Wednesday miscellany with two more events in the coming weeks. Coming on July 27: A benefit for the film Parallax Sounds, a French-Italian-Brazilian (I think) production that explores the relation of the physical landscape of Chicago to the evolution of the post-rock movement of the 1990s and beyond. Director Augusto Contento was named one of the most promising filmmakers of his generation by FilmCritica magazine, and his previous work, Roads of Water, is the only film ever to be distributed by UNESCO (which is pretty cool). The new film, still in progress, features interviews with Steve Albini, Ian Williams, Azita Youssefi, Damon Locks, and Ken Vandermark, who also composed the score for the film. The filmmakers have been shooting around town since November, and the project has recently been covered by the Reader, Pitchfork, and Chicagoist in conjunction with the group’s new Kickstarter campaign to raise an additional $10,000 to complete production. Go to the Kickstarter page to watch an excerpt from the film — which is abstract, but very lovely — and, of course, to donate. 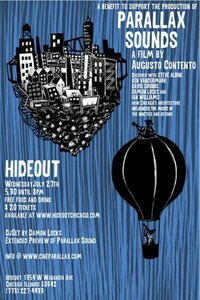 OR, you can come to the Hideout from 5:30-8 PM on the 27th and enjoy FREE BEER (and possibly wine) plus pizza from Pizza Metro, while you listen to a DJ set from Damon and watch a 20-minute preview of the film. For just $20 clams! Because, c’mon – it may not be world hunger, but art is always a good cause. And, hey! Stick around afterward for the Immediate Sound Series’ CD release party for Starlicker, aka Rob Mazurek, John Herndon, and Jason Adascewicz. 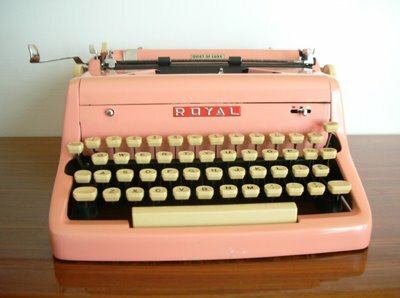 “In this era of instantaneous communication, a handwritten letter is a rare and wondrous item. The Letter Writers Alliance is dedicated to preserving this art form; neither long lines, nor late deliveries, nor increasing postal rates will keep us from our mission. Hot fun in the summer, is what I say. Yes? Yes! See you there, one way or the other. 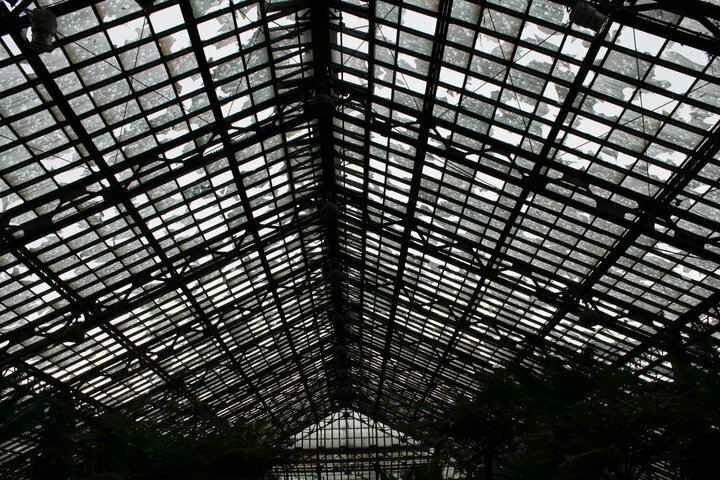 As you’ve likely heard by now, the Garfield Park Conservatory — 105 years old, and one of the largest and most beautiful conservatories in the country, if not the world — was devastated by the June 30 storm that downed trees, cut power, and hammered the city of Chicago with golf-ball-sized chunks of hail. 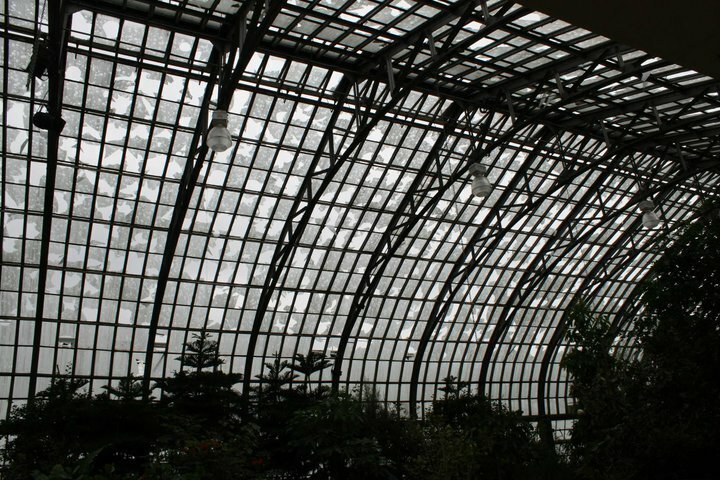 The Garfield Park Conservatory sustained catastrophic damage in last night’s hailstorm, shattering approximately half of the glass panes in the roofs of the historic Fern Room, Show House, and nine propagation greenhouses. 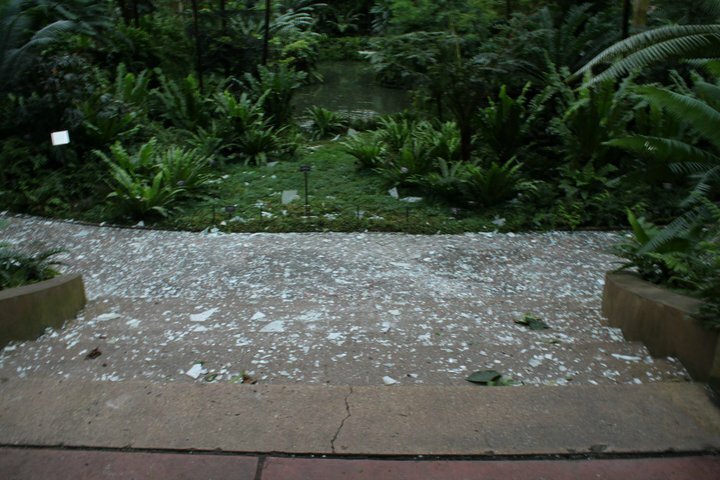 The glass panes in the Desert House also sustained significant damage. 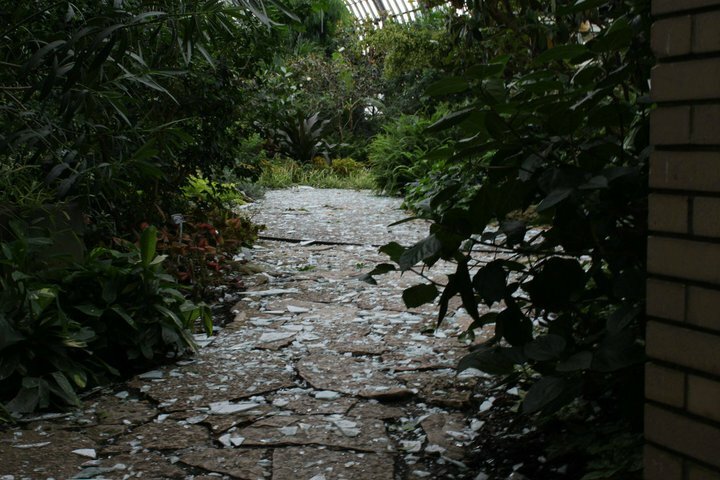 The pathways, ponds and plants in the Fern Room, Show House, Desert House and propagation houses are covered with broken glass, and shards of glass hang dangerously from the roofs. Until the roofs are repaired, rain will cause the ponds to overflow, and direct sunlight will destroy and kill the plants that have been so carefully and lovingly conserved for so many years. Conditions right now are too dangerous for Conservatory staff to go in and care for the plants — which include a huge range of succulents, tropicals, cacti, and ferns as well as a rare double coconut palm that’s possibly the largest of its kind anywhere outside the rainforest. There is glass everywhere: on the floor, in the trees, in the ponds, embedded in bark and leaves and buds. It is, a friend on staff told me, so disastrous on so many levels — structural, horticultural, financial — they’re still trying to sort it all out. What is known is that thanks to this nasty act of Mother Nature, the facility will likely be closed for months. And it’s going to take a whole lot of money to get it up and running again. So, clearly, the situation calls for some soup. And maybe some bread. 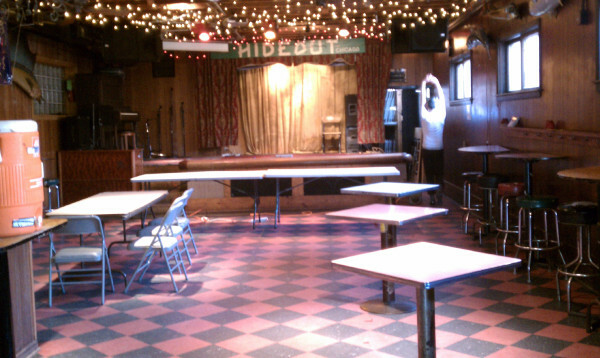 This Wednesday, July 6, from 5:30 – 8, come join us at the Hideout for a Very Special Summer Soup & Bread to benefit an institution that’s one of the few things in Chicago that I, at least, believe is an unqualified public good. 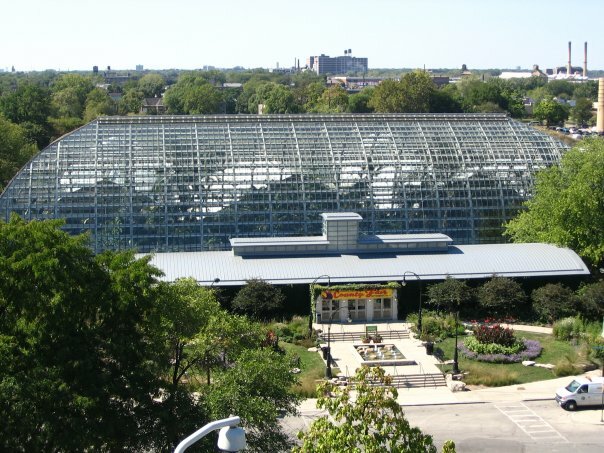 Because the Conservatory isn’t just an architectural treasure — though it is that, designed by Jens Jensen, the MAN of Chicago landscape architecture, and listed on the National Register of Historic Places. And it’s not just an oddly successful tourist attraction, drawing visitors who might otherwise never venture beyond the Bean to the uncharted west side with the twinkly lures of Dale Chihuly glass — though that’s of course great too. 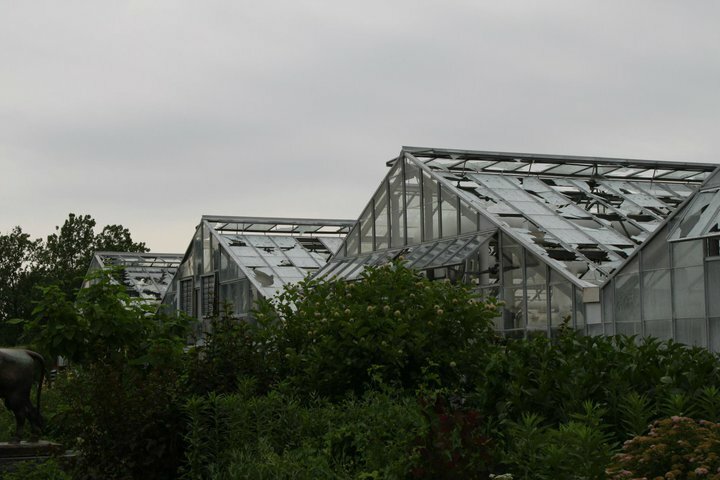 The Conservatory’s also home to the propagation greenhouses (above) that nurture plants for parks across the city – and allow community gardeners and nonprofits to colonize a bit of their bench space for their own heirloom tomatos. It teaches beekeeping and worm composting and provides a home for the U. of I. Extension’s master gardener program (which I was a part of in 2007). It teaches the littlest kids how to nurture a sunflower seed in a Dixie cup. It provides professional development opportunities for teachers interested in botany and ecology. It wrangles rowdy thousands of field-tripping CPS students every year. It reaches out to west-side community groups to help develop their own green spaces and gardens. It hosts a farmers’ market. And, like just about every public programming outfit anywhere, it’s already operating on the slimmest of shoestring budgets. In other words, it is an irreplaceable community resource, one I’ve been lucky enough to volunteer at and learn from over the years. OK. Sure. Realistically, the money we raise at Soup & Bread might repair four panes of glass. But it’s the least we can do. And it will be fun! We miss you! It’s been lonely around there this spring, and we’ve got a brand new patio and everything. So please come out Wednesday and join the Hideout, Swim Cafe, and all the other soup cooks I have yet to round up, in showing our support. We’ll be serving COLD SOUP ONLY, with bread donated by our friends at La Farine Bakery, and tunes spun by Numero Group‘s Michael Slaboch. ETA: Parts of the Conservatory–the undamaged parts–reopened today (Sunday) so go on out and show them some love. 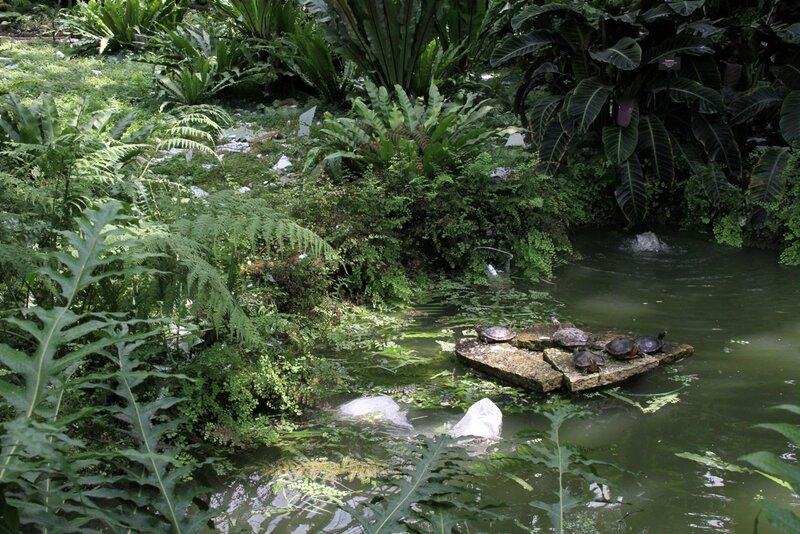 Also, the Fern Room turtles have been sighted and seem to be doing fine. (Shells. They’re handy!) Here they are (above) having a meeting to assess the damage to their pond. It’s true. We shipped it off to Agate yesterday. Hooray! And now … we wait. The book’s not due out until November. But we’ve got some other projects on our plate in the meantime, though. For one, we just found out we’ve been accepted into next month’s Coterie Chicago craft fair, which means three days of hanging around in a tent at Pitchfork listening to the bands from far away. We’ll have recipe cards, aprons, and art prints for sale, as well as some of the few remaining copies of the first Soup & Bread Cookbook and, hopefully, some new recipe boxes from Devon Bergman. If you’re making the rounds, come say hi! And, if you know of another craft fair we should try to crash this season let us know. When we’re not sitting around city parks sweating onto our merch, we’re going to be working on redesigning this website. The launch date is still TBD, but we promise that you, the Soup & Bread audience, can look forward to better navigation, better shopping options, better recipe organization, and just all-around better betterness. If you have any suggestions to make the Soup & Bread web presence more user friendly, we’re all ears. In the meantime, stay cool! We suggest gazpacho. Or a nice vichysoisse. Fun stuff over here @ Soup & Bread Central. The Agate listing for the forthcoming new, revised, shinier, soupier, and wordier Soup & Bread Cookbook went live this week. I know it’s just the internet – and thus a collective delusion – but we’re one step closer to the real deal. Now we just have to finish the book, what? 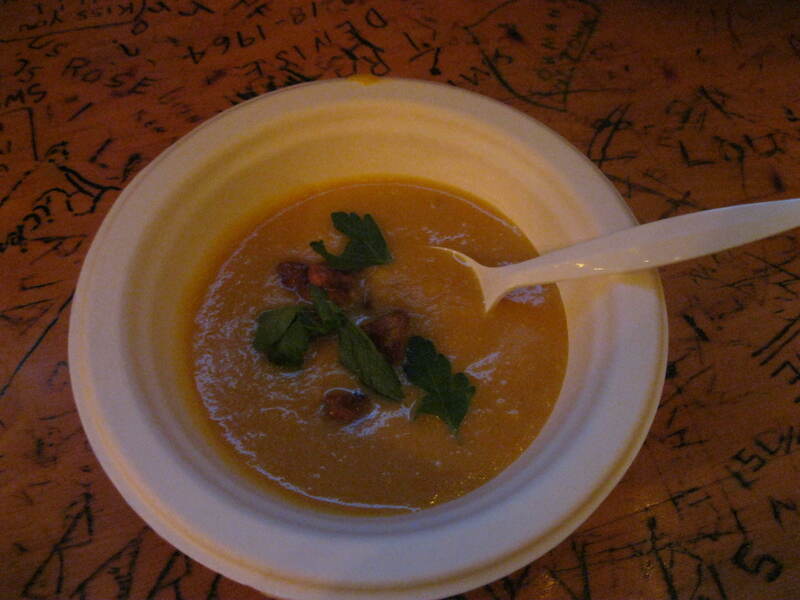 I’ve had a hard time, this past week, to find the juice to recap our final Soup & Bread of the 2011 Soup Season. I may be in denial. Can it really all be over again, already? (The craptastic, if soup-suitable, winter storms of the last few days haven’t helped.) But, finally, I busted out my camera and zipped the photos from last Wednesday into my laptop. I now share them, for the public good. 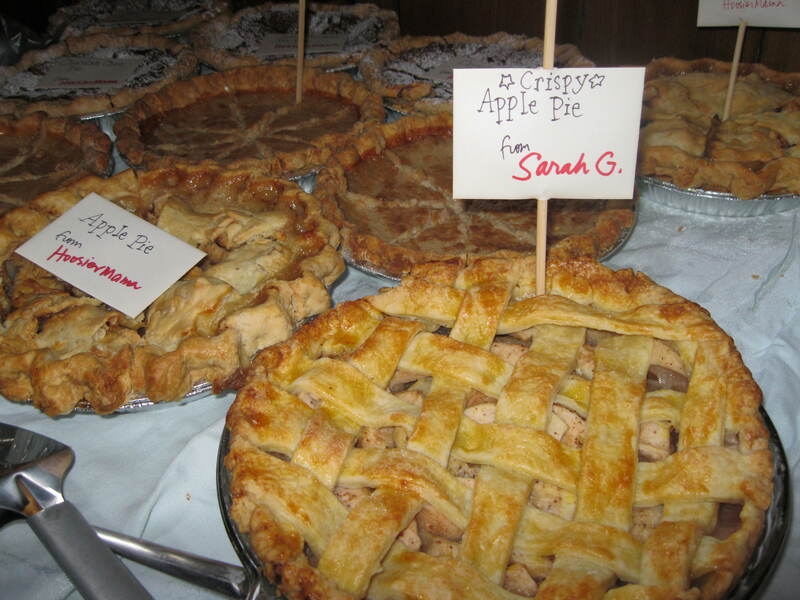 My first stop on last Wednesday’s soup circuit involved neither soup, nor bread, but pie. Hoosier Mama pie, to be precise. 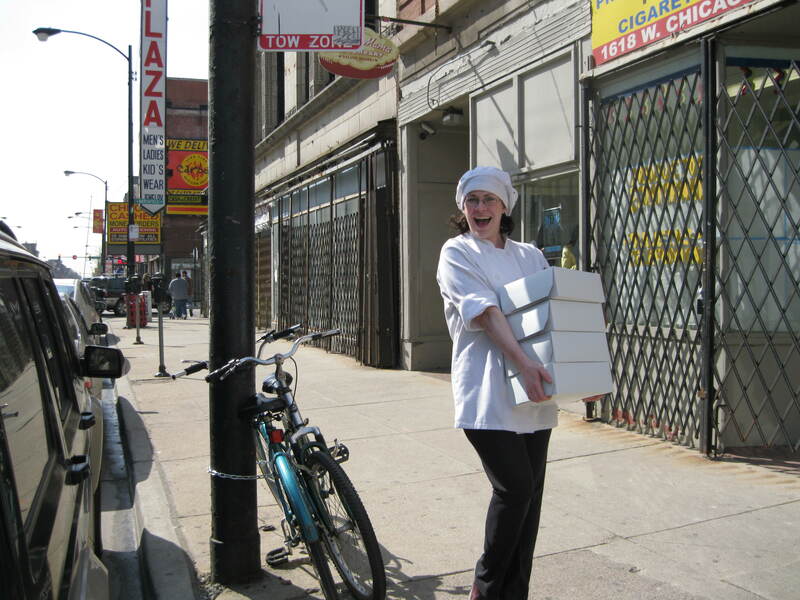 Above, the lovely Rae Hill helps load up the Jeep with box after box of apple, sugar cream, and chocolate chess pies. Thank you Rae! 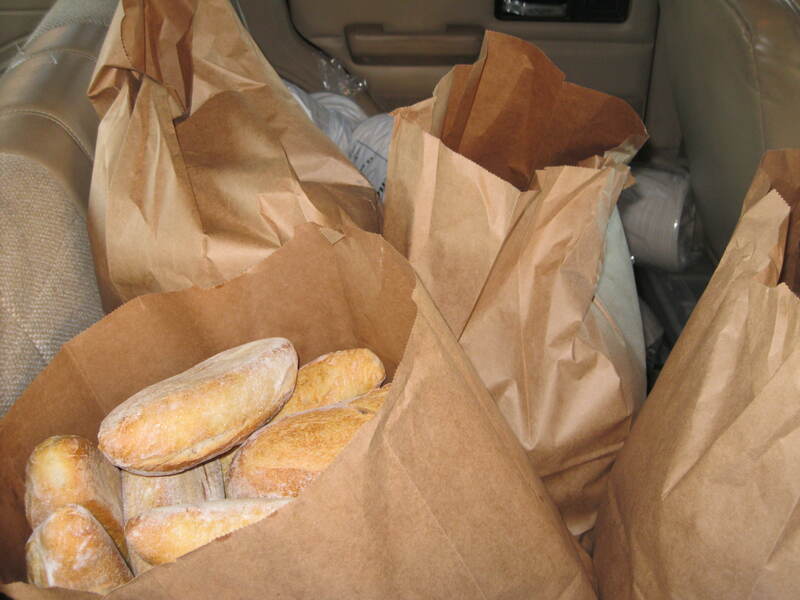 Next stop, just down the street, was La Farine, stalwart and generous donors of loaf upon loaf of crusty ciabatta and other breadstuffs all winter long. Many many thanks to Michelle, Rida, and the whole crew for their ongoing support. It was, as I mentioned, our third annual, now-traditional end-of-the-line Soup & Pie night, with pies wrangled from all manner of contributors by the scrumptious Sheila Sachs. 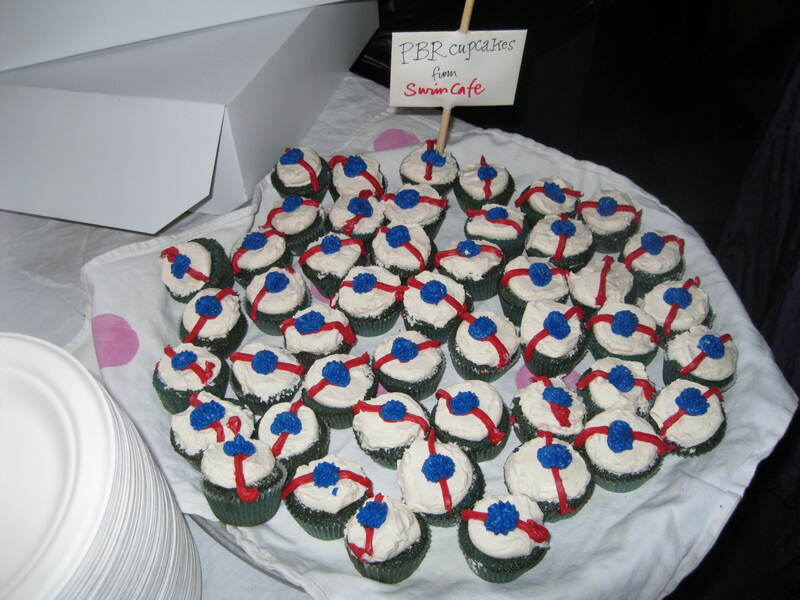 Here’s just one specimen, from overachieving Sarah Gardiner, who did double duty last week as both baker and DJ. Sarah got bumped from her DJ slot by the Great Blizzard of Early February, so DJ Mike “Treetop Lover” Bulington invited her to share the booth with him last week. They brought the deep cuts, and I think Bulington may have landed himself a sweet freelance gig as a result to boot. Thanks Mike and Sarah! Regardless of your feelings about cheap beer and its place in pastry, many thanks are also due to everyone at Swim for their ongoing support of Soup & Bread. Not only did Karen Gerod bring the cafe’s fab artichoke, leek, and pea soup this week, but over the last three months I’ve relied on Swim staffers Dianna Ryan and Ellyn Biko for help with S&B set up. They have wrangled more than enough folding chairs and sliced their share of bread this winter, and I salute them. Thanks Swim team! And, of course, there was soup. So much soup. 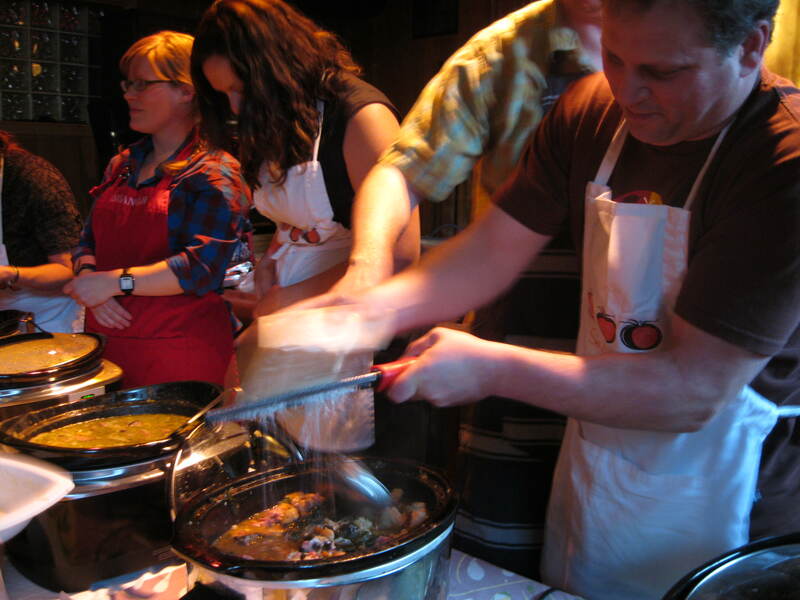 Above, Paul Kahan grates a mess of fresh Parmesan into a hearty pot of ribollita. I was bugging him for his thoughts on soup that night (as I’m working out some currently incoherent thoughts on the ways soup can inspire cooks) and after prodding him he finally confessed that for all the showstopping technique on display at Blackbird — where, for example, a recent soup featured sumac falafel, pickled Asian pears, and caramelized egg yolk — he’d really rather be eating peasant food like this. It was really, really good. And, kudos to the chefs for leaving behind the rest of their grilled bread, which made an excellent late-night snack. And it was chefs, plural, behind the ribollita — Kahan gives all the credit for its execution to Publican chef de cuisine Brian Huston, on the left there, with the PBR. On their right are Soup & Bread newbies Rob and Allie Levitt, formerly of Mado, currently of the Butcher and Larder. They brought a devastating Scotch Broth, and I’m going to pester Rob relentlessly until he gives up the recipe. He did provide a verbal rundown on his stock secret. In a word: Sugo. Popularized by Paul Bertolli in his primer Cooking By Hand, sugo is a method of extracting intense, concentrated flavor from bones and juices and those bottom of the pan scrapings that might foolishly get thrown away. To make the explosively rich stock for the Scotch Broth (above), he said, “You roast the bones, and then cover them with water and cook it and skim it and reduce it down until it’s super concentrated from, say two gallons to one quart of liquid. Then you add water and reduce it again, over and over again, across a period of weeks.” By the end he had two quarts of lamb stock that was so concentrated “it looked like a superball — it was like caramel when you heated it up.” Beyond that, though, I am desperately seeking further instruction. Stand by. 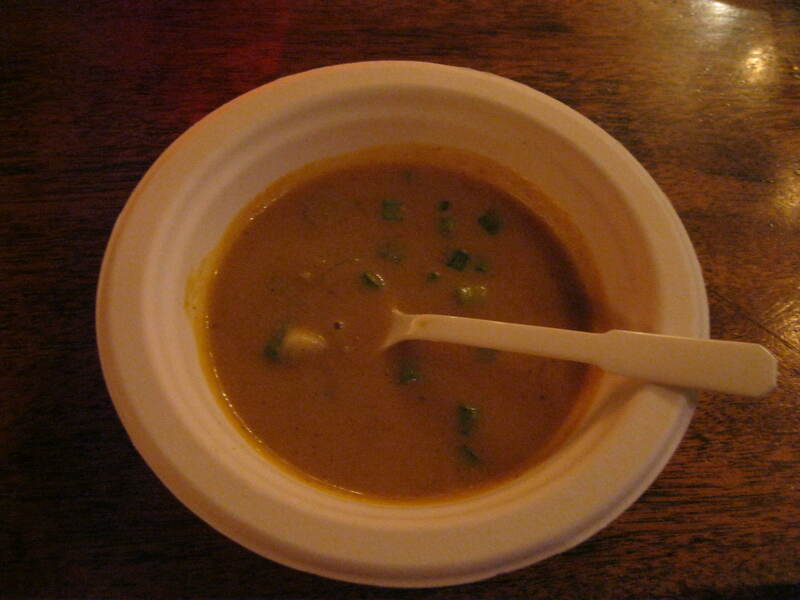 Elsewhere on the soup line we had a mulligatawny soup from Marie Marasovich, a spicy fish soup from Susannah Kite Strang, and a classic split pea with oodles of ham from Annie Coleman. Sadly for me, but good for the rest of you, I only got to taste that last one. The others were gone before I could get my bowl in line. But all told it was an excellent night, full of these serendipitously weird intersections of scenes and relationships that run amok at Soup & Bread. I’m sure we’re not unique in this — but I’d like to think it’s something in the soup. 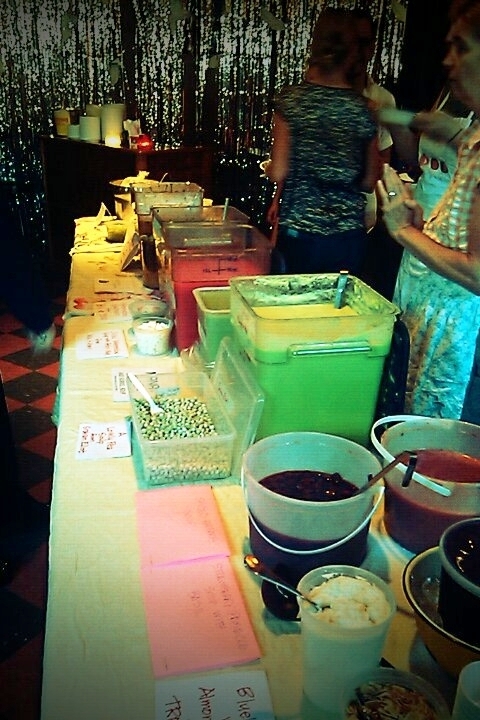 And, did I mention we raised somewhere in the vicinity of $500 for the Common Pantry? And then, it was time to pack up the crock pots and go home. It’s sad to see it end, of course — it’s going to be really quiet behind the bar today — but there’s plenty more to keep us busy until soup season rolls around again. For one, we are putting the finishing touches on the new revised and expanded and spiffed-up Soup & Bread Cookbook, due out in November from Agate Publishing. * And don’t worry there’ll be a whole lot more on that down the road. Until then, though, heartfelt thanks to the Hideout — in particular owners Tim, Katie, Mike, and Jim, and the awesome Wednesday crew, early and late, of Ryan, Brandy, Nick, Jennifer, Ben, Andrea, and Mitch — for all their help and support. And thanks to Ariel Bolles for gamely staffing our merch table, to Bonnie Tawse for wrangling recipes, to Laura Fox for all her organizational help, and to everyone who has ever cooked soup, baked bread, crusted a pie, lent us an iPod, and donated time, money, and good cheer to this preposterous little project. You are all Soup & Bread; without you we’d just be playing Scrabble alone in an empty pub. *And don’t forget about our ongoing Soupscription program! Get in on the limited-edition recipe action now, and get a jump on your neighbors. Danielle and Jason — and adorable baby Hollis — brought this zesty “caulichowder” waaay back on March 9. Oops. Honestly, I’m not even sure this is the right photo, as March 9 was, careful readers of this blog may recall, The Night of Beige Soups. So I’m just sort of going by the garnish here. Seems plausible, yes? Make a chicken stock one day ahead (or buy ready-made). The Bitners used Alton Brown’s recipe, but in addition to the chicken carcass, threw in a smoked turkey leg for flavor. The stock was rich, golden and super flavorful. Roast the cauliflower. Chop, toss in olive oil, spread on baking sheet & cook at 425 degrees F for 25-35 minutes, until golden. Let cool. In a big soup pot, sauté bacon until crisp. Remove cooked bacon, leaving grease in the pot. Let cool a few minutes. Deglaze the pot with marsala wine, getting all the little stuck on crispy bits up. Turn heat back on to medium-high and saute the onion and garlic. Once transparent, add the olive oil and the spices. Sauté for another few minutes until fragrant. Add the stock and cauliflower and the reserved bacon, crumbled. Puree with immersion blender, or if you have to use a blender, do so now while everything isn’t too hot. Blend in batches. If you want some added texture, reserve 1/4 of the cauliflower and add to the puree. Add the cream. Cook over low heat for an hour (more if you can) to let the flavors blend together. Add water or more stock if soup is too thick. Add more cream if you want it super creamy. Serve with a dollop of chevre or sour cream & chopped green onions. The dapper Lawrence Peters is a country singer, songwriter, DJ, and drummer. When he’s not tending bar at the Hideout he’s playing music or spinning records somewhere around town. 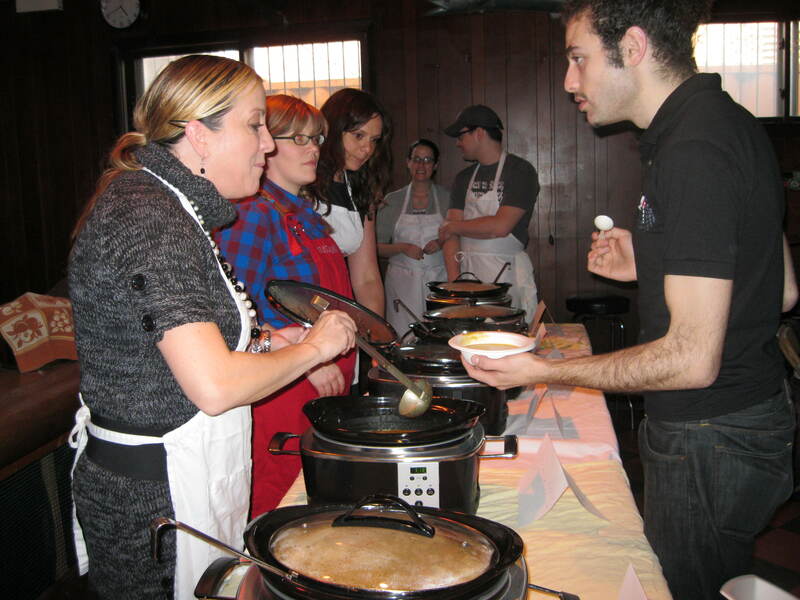 Or, just maybe, he’s making chili — like this tasty blend, which he served at Soup & Bread on (eep) February 23. In a large stockpot, saute the onion and garlic in olive oil. 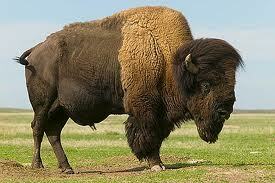 When slightly translucent, add bison, and enough black pepper to cover the meat. Add chili powder, ancho and chipotle pepper, and cook meat until brown. Add all other ingredients, and simmer until squash is tender – about three hours. Add salt to taste. Note: The chili should be thick and savory, but not dense, and it should have a little kick to it. I usually serve this over some chopped rapini, cooked al dente in a little chicken stock.